The name Foxwarren is renown throughout the terrier world. Pedigrees carry the kennel prefix in countries everywhere. Eddie Chapman is the heart and soul of this long established proven working and show kennel of terriers. Eddie has as many, if not more, years of real hands-on earth work experience and show wins himself or through his progeny than any living terrierman in this breed. 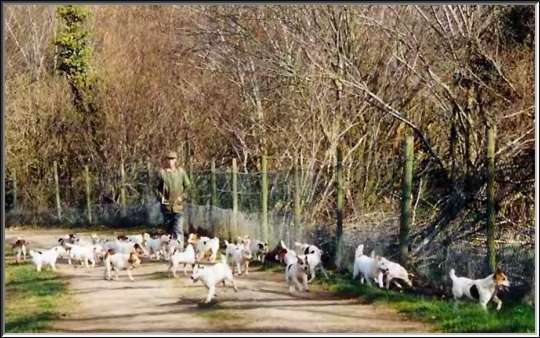 To this day, Mr. Chapman still lends out numerous terriers for other hunts to work in England and Ireland. Mr. Chapman has a genius for recognizing greatness and prepotency in a terrier. With this gift, Eddie has incorporated some of the world's greatest terriers into his bloodlines--terriers like Jaws of Foxwarren, Rebel of Foxwarren, and one of my favorites, Dodger of Foxwarren. Eddie bred many great working dogs in the field and in the show ring from these and other quality breeding females(Foxwarren Nell, Foxwarren Contessa, Foxwarren Psycho). First and foremost , the terriers in his program were structurally built for work; a flexible body with a correctly shaped and spannable chest was imperative as was the instinct and brains to do the job as a baying terrier. And for these reasons, Mr. Chapman is to this day passionately vocal against the use of fell terriers in crossbreeding with the Parson Russell Terrier. Join me on this pictorial journey of Eddie Chapman, a dedicated terrrier man and breeder extrodinaire, and his dogs of The Foxwarren Kennels.